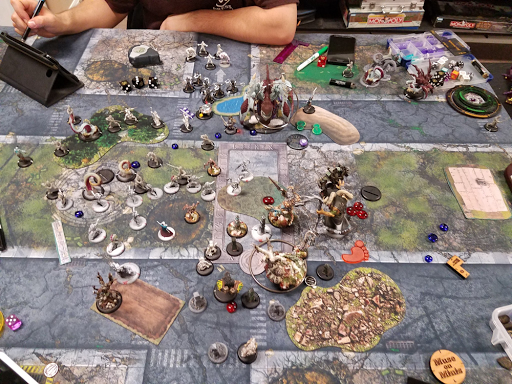 I had the good fortune to drive out to Bellingham, WA with a couple of my buddies to play in what ended up being a 13 man Masters event at Dark Tower Games. It was a great event, lots of friendly and interesting people showed up, and many good games were had. At the time of this writing, I'm currently sitting in my motel at the base of Snoqualmie Pass waiting out a blizzard - don't say I never did anything for you guys, even blizzards can't stop my inane babblings. 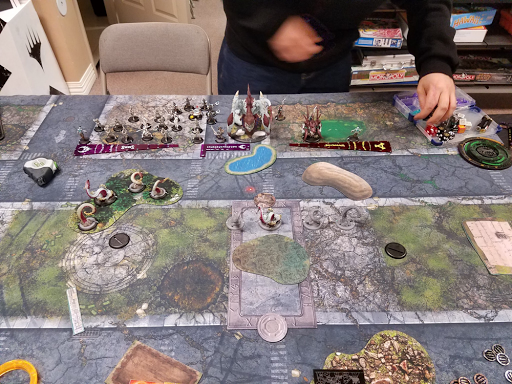 Round one I got paired with a very nice man from Vancouver, BC with a Thagrosh beast build using Angelii, and a Kallus list with a blightbringer and unit of swordsman. We were playing Recon, and there was a massive forest in the middle of the zone, so naturally I chose to play Wurmwood. My opponent won the roll off and chose the side he was on, which I think was a mistake. I deployed very centrally, nothing special. I kept the Bokur away from the rubble, but it looked like a great place to park my beasts until they were ready to go in on the Blightbringer. My opponent deployed in a way that was, in my opinion, somewhat incorrect. He chose to put his swordsman behind the massive forest on my left side, which meant that not only would they have a hard time getting to the fight, but they were also immediately lined up against my tarpit/ attrition unit. His Blightbringer and Scytheanwent central to right, and Kallus went central left. 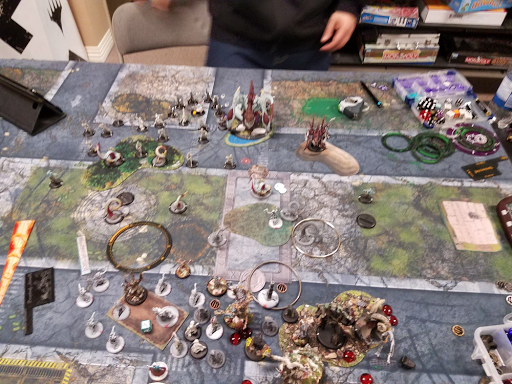 He put a Hellmouth right in the zone, which was really annoying, and he out the other by the left flag, further cementing my plan to just never go into that half of the table. 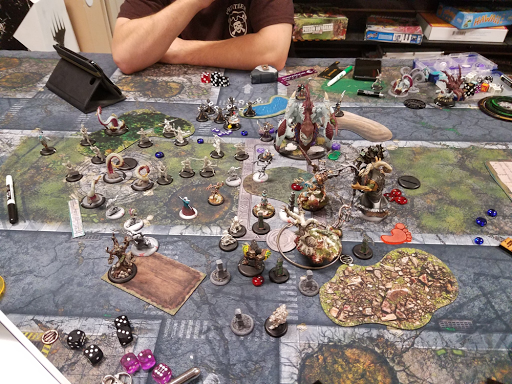 My turn 1 started off as usual - Bone Grinders murdered each other and a Mannikin, giving Wurmwood three souls and the Bokur 3 corpses. 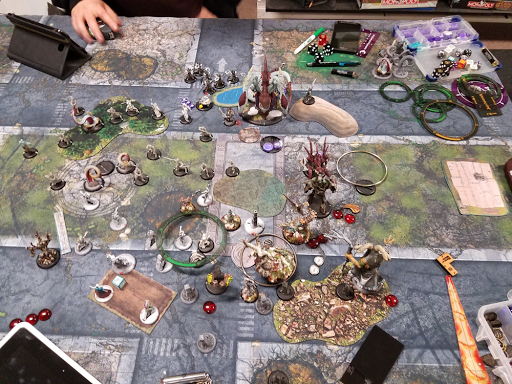 Cassius ran up to the left, and Wurmwood put Curse of Shadows on the Hellmouth. I pulled Cassius back and cast Wild Growth on the right side to make the Blightbringers' gun much less useful. Lanyssa slew another Mannikin from the other unit, and the between the two units I did a couple of points to the Hellmouth. The Bokur ran. Beasts riled and ran. My opponent advanced up the table cautiously. A shot from the Blightbringer deviated and killed some chaff. Hellmouth tentacles killed Mannikins in a weird dance of recursion. The Scythean walked up to the hill. I upkeep Curse of Shadows and Wurmwood has 9 fury. My plan for the turn is to Stranglehold both of his beasts and kill the Hellmouth, setting up the Stalker to charge in next turn on the objective or Blightbringer. Killing the Hellmouth goes as planned, a few boosted sprays and charges from Mannikins later and it goes down. Success! Megalith tramples up and whiffs his Stranglehold on the Scythean. Cassius runs, and I fail to Stranglehold the Blightbringer twice in a row. 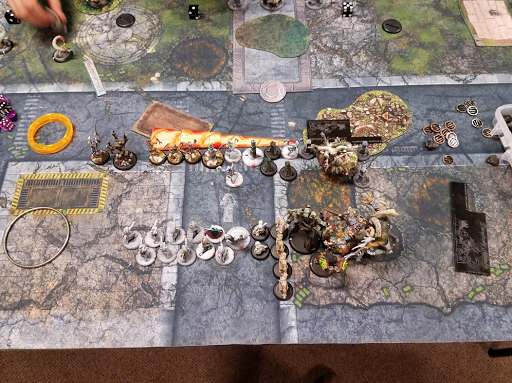 The Bokur unit runs and charges, killing tentacles for corpse and soul tokens. 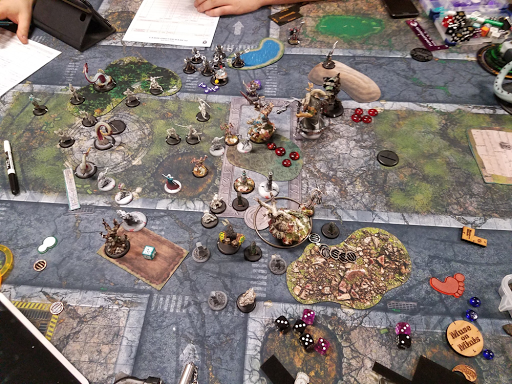 Gobbers make a cloud and Brennos shoots the right hand Spell Martyr off the table. Lanyssa chills out in the trench 15 inches from the objective. Kallus goes first, moves up, casts Dark Guidance and pops feat. Swordsmen go in and murder a lot of Shamblers, feeding the Pot corpse tokens. The Blightbringer advances and shoots the Stalker, dealing reasonable damage and choosing the +2 strength and armor mode. He rolled absurd blast damage and did four to Wurmwood at dice off 12. His Scythean charges and really hurts Megalith. Well he didn't contest with a whole lot, so I think this is feat turn for me too! Megalith heals his body back and murders the Scythean dead. Mannikins and Shamblers kill both Swordsmen and the Incubi they spawn. I just engage the rest, no reason to waste my time on killing things twice. 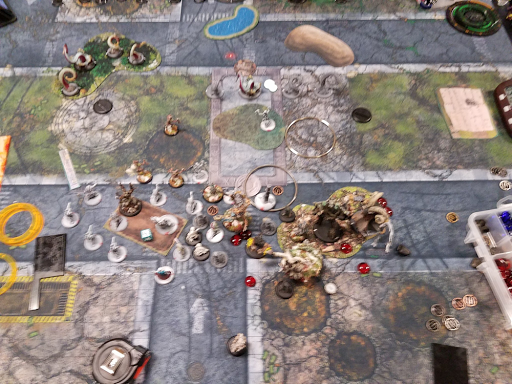 Lanyssa casts Hunters Mark on the objective, and the Stalker goes in and blows it up before Sprinting back. 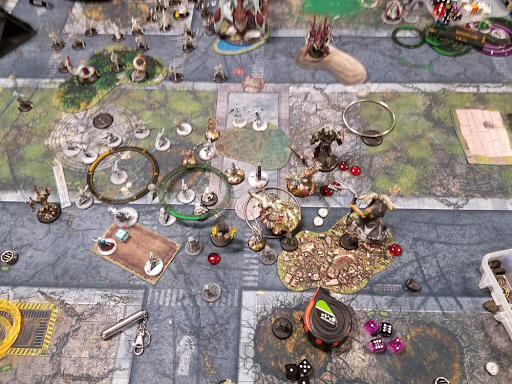 Cassius runs, and Wurmwood finally lands a Stranglehold on the Blightbringer after I cast Curse of Shadows on it. I pop feat, and Brennos moves up and deviates his spell onto the Blightbringer. I go to 3 points. Well it's Wurmwood's feat turn, so nothing much is going to happen. He kills some more Shamblers, and the Blightbringer and Kallus both go into the zone. He makes a Shredder with the pot which also contests. Okay, I gotta kill a colossal, a Shredder, and a Swordsman. Seems doable. I upkeep Curse of Shadows and move Lanyssa up, landing the Hunters Mark on the Blightbringer. Mannikins spray, but fail to kill the Swordsman. Megalith and Brennos charge in and kill the Blightbringer. The Stalker walks up and kills both the Shredder and the Swordsman. I get 2 more points. Score 5-0, Victory for the Druids! Legion has a really hard time into Wurmwood in general, especially on this Scenario, and more especially with this terrain set up. He made the game harder on himself by deploying the Swordsmen and second Hellmouth on the opposite side of the table from my heavies. Had he out the Blightbringer across from the Bokur and the Swordmen across from my beasts, I think this game gets much, much harder. On to round two!